Study Medical Photos: Scoliosis- Case Study. A 12 year old boy is seeing you for a physical examination required for junior high school sports. You plan to evaluate him for scoliosis. Q 1. Which screening method is the most sensitive for detecting scoliosis? Answer: The "Forward Bending Test" which is accomplished by having the patient bend at the waist with feet together and hands hanging free. Observe the patient (with shirt off) from behind and note any elevation of the ribs or paravertebral muscle mass on one side. The elevation should be measured in degrees (inclinometers are available), and an inclination of 5 degrees or more should be evaluated further. Answer: Scoliosis is a lateral curvature of the spine, usually accompanied by rotation and generally occurring in the thoracic or lumbar areas. It can occur with excessive kyphosis (posteriorly convex curvature) or lordosis (anteriorly convex curvature). Q 3. On forward bending test, you find slight elevation of the left paravertebral muscles mass, which you estimate to be 7 degrees. The remainder of the examination is normal. You decide to obtain radiographs that show 12 degrees of angulation (Cobb angle). C) Related to a tumor. The correct answer is “B.” Idiopathic. 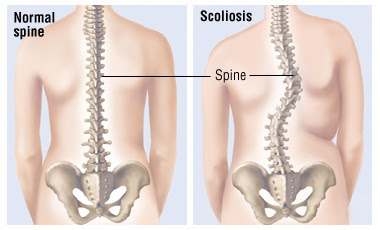 Most scoliosis that develops during adolescence is idiopathic. When there is no pain, fever, weight loss, or other warning signs (e.g., neurologic symptoms), the curvature is unlikely to be due to tumor or infection. “A,” congenital scoliosis, typically presents earlier in life. The correct answer is “B.” Observation. Bracing for scoliosis should be limited to those with idiopathic scoliosis and 20–40 degrees of angulation. Bracing is only effective if the child is still growing and <1 year past menarche if female.